Psychological evidences of impulsivity and false consensus eect lead results far from rationality. It is shown that impulsivity modies the discount function of each individual, and false consensus eect increases the degree of consensus in a multi-agent decision problem. Analyzing them together we note that in strategic interactions these two human factors involve choices which change equilibriums expected by rational individuals. Ainslie G., “Specious reward: a behavioral theory of impulsiveness and impulse control”, Psychological Bulletin, 463-496 (1975). Bickel W. K., Odum A. L., Madden G. J., “Impulsivity and cigarette smoking: delay discounting in current, never, and ex-smokers”, Psychopharmacology 4, 447-454 (1999). Fedrizzi M, Kacprzyk J, Nurmi H., “Group decision making and consensus under fuzzy preferences and fuzzy majority”, Fuzzy Set Syst 49:21–31 (1992). Fedrizzi M, Kacprzyk J, Nurmi H., “Consensus degrees under fuzzy preferences using OWA operators”, Contr Cyberne 22(2):78–86 (1993). Frederick S., Loewenstein G., O’Donoghue T., “Time Discounting And Time Preference: A Critical Review”, Journal Of Economic Literature 40, 351-401 (2002). Kahneman D., Slovic P., Tversky (Eds. ), “Judgment under uncertainty: Heuristics and biases”, Cambridge University Press, New York and Cambridge (1982). Laibson D. I., “Golden Eggs and Hyperbolic Discounting”, Quarterly Journal of Economics 112, 443-477 (1997). Loewenstein G., Prelec D., “Anomalies in intertemporal choice: Evidence and an interpretation”, Quarterly Journal of Economics, pp. 573-97, (1992). Mullen B., Atkins J.L., Champion D.S., Edwards C., Hardy D., Story J.E.,Vanderklok M., “The false consensus effect: a meta-analysis of 115 hypothesis test”, J Exp Soc Psychol; 21:262–283 (1985). Nash J., “Non-Cooperative Games”, The Annals of Mathematics, Second Series, Vol. 54, No. 2, pp. 286-295, (September 1951). O’Donoghue T., Rabin M., “Doing it now or later”, American Economic Review, 89:1, pp. 103-24 (1999). Ross L., Amabile T.M., Steinmetz J.L., “Social roles, social control and biases in social perception”, J Pers Soc Psychol; 35:485–494 (1977). Samuelson P. A., “A Note on The Measurement of Utility”, The Review of Economic Studies 4, 155-161 (1937). Strotz R. H., “Myopia and Inconsistency in Dynamic Utililty Maximization”, Review of Economic Studies 23(3), 165-80 (1955-1956). Takahashi T., “Theoretical frameworks for neuroeconomics of intertemporal choice”, Journal of Neuroscience, Psychology, and Economics, Vol 2(2), 75-90 (2009). Takahashi T., Ikeda K., Hasegawa T., “A hyperbolic decay of subjective probability of obtaining delayed rewards”, Behavioral and Brain Functions, ResearchBio Med Central (2007). Thaler R., Shefrin H. M., “An Economic Theory of Self-Control”, Journal of Political Economy (University of Chicago Press) 89(2), 392-406 (April 1981). Thaler R., “Quasi Rational Economics”, New York, Russell Sage Foundation, 127-133; In Loewenstein, G. and Elster, J., Eds., Choice over time, New York, Russell Sage Foundation, (1991). Ventre A. G. S., Ventre V., “The intertemporal choice behaviour: classical and alternative delay discounting models and control techniques”, Atti Accad. Pelorit. Pericol. Cl. Sci. Fis. Mat. Nat., Vol. 90, Suppl. No. 1, C3 (2012). Yager R.R. “On ordered weighted averaging aggregation operators in multi criteria decision making”, IEEE Trans Syst Man Cybern, 18(1):183–190 (1988). VENTRE, Viviana; LONGO, Angelarosa. Impulsivity and information in cooperative and non-cooperative decision problems. 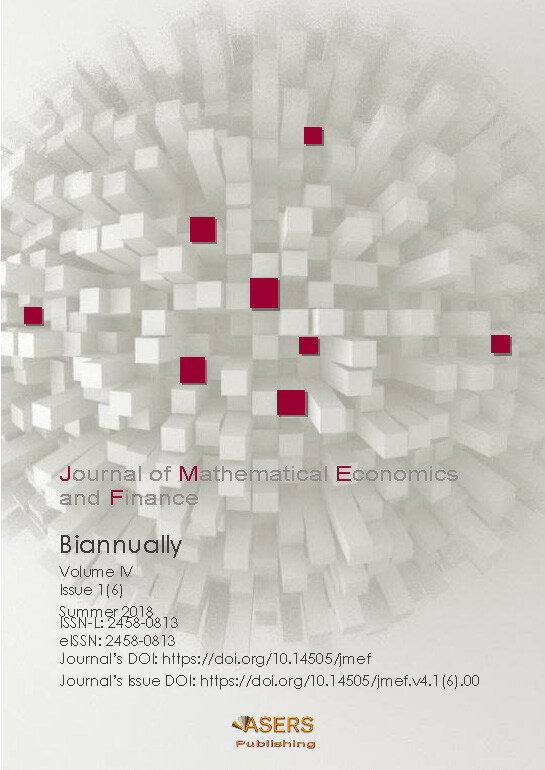 Journal of Mathematical Economics and Finance, [S.l. ], v. 4, n. 1(6), p. 9-38, june 2018. ISSN 2458-0813. Available at: <https://journals.aserspublishing.eu/jmef/article/view/2400>. Date accessed: 22 apr. 2019. doi: https://doi.org/10.14505//jmef.v4.1(6).01.